Alcoholism in the home has long-lasting effects. 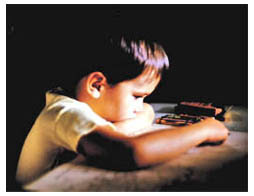 Children of alcoholics often learn to cope with an unhappy childhood in ways that cause problems for them later in life. Learning about how alcoholism affected your past can help you build a better future. * They become super-responsible, like a miniature adult. * They become a trouble maker. * They become able to adjust to any change, without noise or fuss. * They become a family clown or peacemaker, smoothing over troubles. Children of alcoholics often believe they are all alone, that no other families have these problems or that it is up to them to cure the parent. A child may take the blame for a parent's alcoholism — or the parent may blame the child. As a result, many children of alcoholics not only feel unloved, but unlovable. Some of them suffer physical or sexual abuse, which reinforces this feeling. And because life at home is full of disappointments, broken promises and lies, the child learns not to trust, not to get too close to anyone and not to communicate in healthy ways. Adult children of alcoholics often retain their childhood patterns. The super-responsible child may grow into an adult who demands perfectionism. The child who is the family's scapegoat may have legal or financial troubles throughout life. The child who used to adjust to anything may be passive and withdrawn as an adult. And the family clown may grow up to be entertaining, but irresponsible. An adult child of an alcoholic may be anxious, may try to control events and relationships, may have trouble being intimate, may be chronically depressed or have stress-related health problems. Tragically, many children of alcoholics either become chemically dependent themselves or marry alcoholics. * Gently encourage the child to talk about life and listen to what they say. * Invite the child to an outing or offer a quiet place to do homework. * Encourage the child to think of people who would be understanding and helpful in hard times — perhaps a teacher, friend, relative or neighbor. * If the parent drinks and drives, give the child your phone number and offer to come pick him/her up. * Suggest resources for the child, such as Alateen. * Tell the child that he or she cannot cause, control or cure the parent's drinking. * Tell the child that alcoholism is a disease and it's OK to love the parent but hate the disease. Finally, if yougrew up with an alcoholic parent, find out more about alcoholism and its effects on family members of alcoholics. Talk about your feelings and experiences with friends, relatives, people in 12-step programs, health professionals. Remember you didn't cause your parent's drinking and no one but the parent had any chance of controlling or curing it.